- Use as intro to COMPLEX or as 24 hour booster to hyperpigmentation regime. Clinical studies demonstrate a reduction of discoloration and hyperpigmentation by 75% in only 3 months. 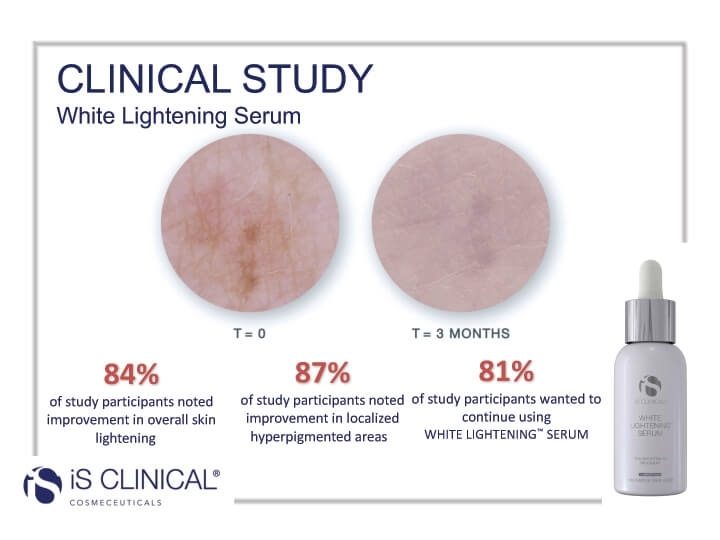 A Clinically proven lightening treatment formulated to target discoloration and hyperpigmentation. This concentrated lightweight serum treats and prevents hyperpigmentation , provides controlled exfoliation and gently resurfacing benefits. Use as intro to COMPLEX or as 24 hour booster to hyperpigmentation regime. Helping to remove pigmented areas. Avoid immediate eye area contact. Place 2-3 drops on back of hand to then apply sparingly to clean skin over the face or affected pigmentation irregularities. For best results use as guided by aesthetic practitioner or as part of the IS Clinical Hyperpigmentation regime.